Easily one of the best debut albums of the ‘90s, this spunky and confident landmark album – and the band’s only disc with original drummer Tony McCarroll – would make seismic waves in the U.K., where the band was instantly heralded as a Britpop rival to the likes of Blur and Pulp. But Oasis set itself apart from the competition with its greater emphasis on guitar, a distinct fondness for classic rock, and distinctly sunnier, less cynical lyrical content (initially, anyway); if the band could occasionally sound derivative, they at least had the good taste to draw heavily from all the right bands, and Noel Gallagher, much like his idol Paul Weller (of The Jam and Style Council fame) has a gift for recapturing the sound and feel of the best music of the ‘60s yet still making it feel oddly and distinctly contemporary in a way that made it much more at home on Top 40 radio at the time than it would seem to on paper, even in a U.S. radio market still very much consumed by grunge at this point. That the songs are played with such expert swagger, sounding exactly like the anthems they were likely intended to be, is merely the icing on the cake, and songs like “Shakermaker,” the sludgy, Faces-recalling “Cigarettes and Alcohol,” the slinky groove of “Supersonic,” “Slide Away” (reportedly written on Johnny Marr’s guitar and, in spite of being the favorite Oasis song of many fans, Paul McCartney included, surprisingly passed over as a single) and “Rock ‘n’ Roll Star” all demand your attention, while “Live Forever” became an unlikely American hit and helped to bring Brit-rock back to alternative radio in a big way. “Live Forever” may have been a minor American hit, but its parent album wasn’t nearly as iconic on this side of the Atlantic as it was in the U.K.; this disc, on the other hand, would rocket them to superstardom in the U.S. and spawn a string of instant classics that still pop up on a regular basis on American alternative stations. Interestingly, the band’s sound is no less distinctively British here than it was on Definitely Maybe, so it’s not that the band’s music necessarily was any better suited for American consumption this time around than last. But while the debut was a hodgepodge of styles, mimicking all sorts of classic-rock bands from the Stones to the Kinks to T. Rex, there’s a bit more focus this time around, namely the band’s Beatles influences, to the extent that the breakthrough single even takes its name from George Harrison’s first solo album. But whatever points the band might lose for in originality they make up for with the loving craft they’ve put into these songs, Noel bringing in an even stronger set of hooks to the table this time around, while brother Liam has grown by leaps and bounds as a vocalist since the last record, to the extent that his best work here isn’t even on the rockers like “Some Might Say” or “Morning Glory,” great songs though they are, but, rather, on the ballads, which are easily the band’s best yet, highlighted by the breathtakingly beautiful epic “Champagne Supernova” (featuring a guest turn on guitar from Paul Weller), the anthemic “Don’t Look Back in Anger,” and the acoustic singalong-worthy “Wonderwall,” sadly the band’s lone Top Ten hit on these shores. Even the filler cuts here, like the Kinks-like novelty “She’s Electric,” are overflowing with hooks and charm both that make them much more addictive than their usual album padding. Best of all, it’s all sequenced in a way that makes the disc seem even more than Definitely Maybe like a record that was meant to be experienced and appreciated as an album piece. Ironically, the same thing that makes this album so entertaining and intriguing is the very same thing that ultimately works the most against it and prevents the disc from reaching the same majestic heights as the prior two albums: it’s just really, really over-the-top, almost to the point of being comical. The band’s Beatlesque ambitions get just a little too grandiose for their own good here, not so much for the occasionally overstuffed production (especially on the opener “D’you Know What I Mean?,” which incorporates everything from feedback to Morse code) but mainly for the sheer running times of the songs: concise songs, these are surely not. [Only three songs here clock in at less than five minutes, one of which is merely a reprise of an earlier song, while two of the four singles clock in at over seven, “D’You Know What I Mean?” lasting just under eight minutes and “All Around the World” lasting just under ten!] The result of all this is that the disc has a total running time of nearly seventy-two minutes, which seems unfathomable for a Brit-pop record with just eleven proper songs. But, to the credit of Noel Gallagher and his songwriting talent, these songs – tighter though the actual arrangements could have been, especially on “All Around the World” – still manage to have just enough hooks and sing-along charm to not completely test one’s patience, and the singles, at least, while stopping a bit shy of the brilliance of those on Morning Glory, are still quite solid by any other standard, especially the emotional balladry of “Don’t Go Away,” which, along with “Fade In-Out,” nicely demonstrates Liam’s continued growth as a vocalist. And in spite of the disc’s filler, the album still works almost as effectively as an album piece, albeit an overblown one, as Morning Glory, and is actually quite amusing to listen to in all of its full, ahem, glory. It’s certainly up to debate whether or not this should even be considered one of the band’s official studio albums, if only because of its nature as a compilation of the band’s B-sides to date. Still, the band’s B-sides during their earliest years were just as first-rate as anything that can be found on their full-lengths, and indeed, were often superior to a lot of other ‘90s rock bands’ A-sides, so we couldn’t do a column on Oasis and not include this majestic disc. 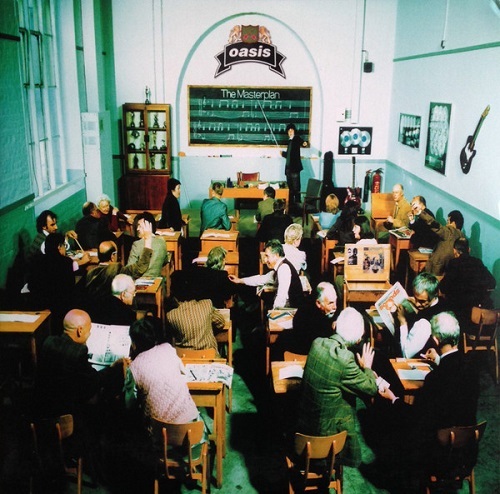 Honestly, the hooks here are both more infectious and plentiful than those on their last actual studio album, Be Here Now, particularly on the fiery “Some Might Say” B-side “Acquiesce” (jointly sung by Liam – on the verses – and Noel – on the chorus – to stunning effect), which you could actually make a solid case for as being the band’s greatest song; the raucous rocker “Fade Away,” which boasts one of Noel’s most awe-inspiring sets of lyrics; and the stirring, “unplugged”-style, Noel-sung ballad “Talk Tonight,” one of the band’s most beautiful sides to be found on any disc. [Other highlights include “Underneath the Sky” and “Half the World Away,” the latter of which would later become the theme to the British series The Royle Family.] Even if the disc wasn’t designed to be a studio album per se or a traditional album piece, it makes for a first-rate compilation and one that sounds as if it could have even passed for a greatest-hits disc had the singles these songs appeared on simply been flipped over. It’s not quite as essential a purchase as either of the first two albums, but this is nonetheless a must-own for any Oasis fan, unless, that is, you’re so devout a fan that you’ve sought out all the original singles (most of them only available in this country as imports) these songs hail from. Unfairly trashed by most critics, it’s true that this disc falls far short of such masterpieces as Definitely Maybe and Morning Glory and even the B-sides package The Masterplan, but it’s actually a lot better than it was made out to be at the time. Its best songs might actually be more immediately infectious than those on Be Here Now, although that disc does still have an edge over this one owing to its obvious design as an album piece. [This album, in contrast, seems a bit more hasty and muddled in its assembly, strangely delegating one of its best songs and its should-have-been-album-closer, “Let’s All Make Believe,” to a bonus disc that’s technically just a two-song CD single comprised of a song that already appears in identical form on the first disc – “Go Let It Out” – and its B-side.] The band lost two members during the making of this record, which means that the album is primarily the work of the two Gallagher brothers, with Alan White still on hand to supply the drums, Noel playing most of the other instruments here. Longtime fans derided the experimental nature of the material, but it’s not the fact that the record sounds so different from the previous three that makes it less appealing so much as that it’s simply got just a little too much filler like “Put Yer Money Where Yer Mouth Is” and “I Can See a Liar” and that nearly all the best songs arrive too early in the album’s sequencing. “Where Did It All Go Wrong?,” one of the few solid songs in the disc’s back half, is one of the band’s best Noel-sung numbers and got overlooked, while the Liam-helmed “Who Needs Love?” is a surprisingly successful stab at incorporating Indian influences into the band’s sound. But it’s the psychedelia-tinged chug of the highly infectious “Go Let It Out” that’s both the album’s best song and one of the band’s most criminally underrated singles. It’s spotty, no doubt, but there’s still at least half of a great album here, and the better songs here are still definitely worth checking out. It’s not quite a full return to form, but Heathen Chemistry finds the newly-reconstituted band (guitarist Gem Archer and bassist Andy Bell have joined the fold) taking a step back in the right direction. The disc is less distinctly experimental than the last one, finding the band reverting to the classicist rock of the first three albums yet without sounding as if they’re making a complete U-turn. [The Indian influences from the last disc’s “Who Needs Love?”, for one, crop up again on the excellent lead-off single “The Hindu Times.”] Rather, they simply sound more relaxed than they have since Morning Glory, free of the pressures of following up one masterpiece with another and simply rocking out with enthusiasm and ease. Noel’s songs here can occasionally seem a bit too much like rewrites of past originals (“Little by Little” and “Stop Crying Your Heart Out,” for example, both sound as if they could have been written at the same time as Be Here Now, although they’re actually a bit more immediate – and far more concise, too, for that matter – than most of the songs from that disc), but they’re solid nonetheless. 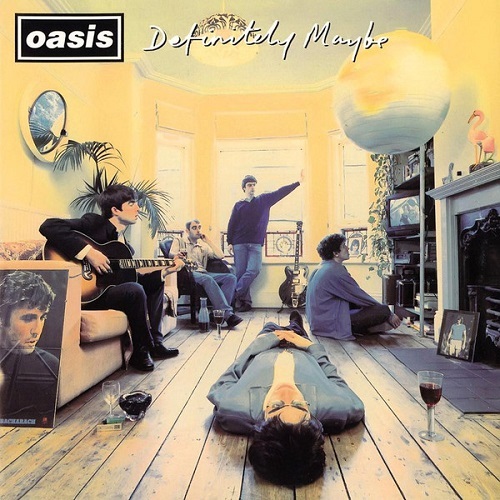 Ironically, it’s when the band is not trying quite so deliberately to sound like their old selves that the album truly is at its most fun, the acoustic bounce of Noel’s “She Is Love” having a real sunny charm to it that we haven’t seen on any Oasis song since “She’s Electric,” while the rustic simplicity of Liam’s self-penned “Songbird” surprisingly turns out to be the most infectious piece of songwriting on the whole disc. Arguably the band’s finest hour since Morning Glory, this disc is just jam-packed with one solid hook after another, made all the more stunning by the fact that Noel has written only five cuts here and allowed the remainder of the band (here augmented by Zak Starkey, deputizing for the recently-departed Alan White, on drums, though he wouldn’t be made an official member until the next record) to contribute to the writing. And, boy, do they ever step up in a big way! Liam, building on the brilliance of the last album’s “Songbird,” contributes three winners this time around (“Guess God Thinks I’m Abel,” “Love Like a Bomb,” penned with Gem Archer, and, best of all, the incredibly infectious sucker-punch of “The Meaning of Soul,” a fully-realized song that the band storms through at a Ramones-like pace, the cut clocking in at less than two minutes! ), while Andy Bell contributes a standout of his own with “Keep the Dream Alive” and Gem Archer demonstrates his knack for crafting a solid melody with the highly catchy “A Bell Will Ring.” Though he takes an intentional backseat here, Noel is still in fine form here, offering up the fine lead-off single “Lyla” and the anthemic closer “Let There Be Love,” the even catchier swirling melody of “Part of the Queue,” and the great, Kinks-recalling album cuts “The Importance of Being Idle” and “Mucky Fingers.” But, beyond the album’s abundance of hooks, the disc also lingers in the brain for long after it’s done spinning simply due to the sheer joy it sounds like the band had while making the record. This is simply the most downright fun record the band has issued since The Masterplan. The lineup remains intact from the last record and the songwriting remains divided amongst all four principal members, but the band has left its longtime U.S. home of Epic for a new deal with Reprise for this disc, which would turn out to be its final album together before splitting. [Noel would later form Noel Gallagher’s High Flying Birds, while Liam, taking Bell and Archer with him, would form Beady Eye.] The disc certainly sounds good when it’s on, and when it rocks, it really rocks (especially on the album’s two best tracks, the fiery rockers “Bag It Up” and the lead-off single “The Shock of the Lightning,” easily the catchiest song here), but the biggest difference between the last album and this one is that Don’t Believe the Truth was very much a song-based album, heavy on carefully crafted – and occasionally even retro-flavored – melodies, whereas much of this material feels as if it evolved out of studio jams, which means that the songs are a lot less immediate this time around and don’t stick in your head quite as instantaneously, even if they’re still reasonably good. (Other highlights include “(Get Off Your) High Horse Lady” and “I’m Outta Time.”) It’s at least as solid an affair as Heathen Chemistry, but you can’t help but feel afterwards as if the band would have gone out on a more glorious note by letting the more infectious and playful Don’t Believe the Truth serve as their swan song. There are just two Oasis compilations released in the U.S. to choose from – both of them double-disc packages – and both of them are a bit flawed. Time Flies … 1994-2009 collects most of the band’s hit singles during this time period, but there’s one problem with that approach: much of the band’s greatest work wasn’t the hits, as the B-sides anthology The Masterplan proved in a very big way. The 2006 package Stop the Clocks doesn’t cover as much ground, its eighteen songs including none from Be Here Now (not even “Don’t Go Away,” bizarrely enough) and only one a piece from Standing on the Shoulder of Giants (“Go Let It Out,” thankfully) and Heathen Chemistry (“Songbird” – again, thankfully), but you do have the added bonus of getting four songs from The Masterplan (an album not represented at all on Time Flies), including the masterpieces “Acquiesce” and “Talk Tonight.” Couple those songs with the aforementioned late-career highlights and five songs a piece from both Morning Glory and Definitely Maybe, and you’ve got yourself a fairly solid – though not exactly complete – career summary.